A talented woman becomes entranced with a mega-wealthy family in a story about a mysterious love with two faces; the battle to stay relevant in the post-literate world; a shocking betrayal that exposes the past of characters “rotten with secrets”; and, finally, the passion to reclaim old dreams. This genre-bending novel mixes heartbreak, Gothic atmospherics, and a satire of New York’s high-stakes players. 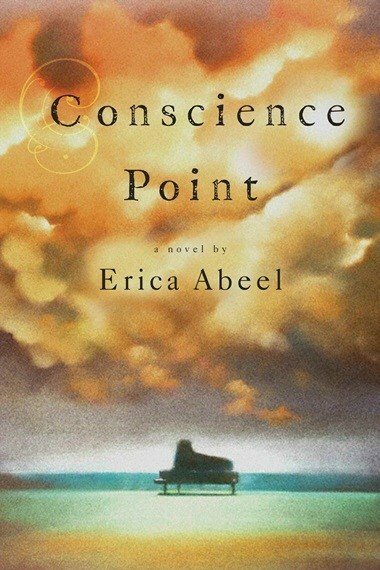 Conscience Point is about Madeleine Shaye, a beautiful over-achiever with a dual career as concert pianist and TV arts correspondent; her adored college-age daughter, adopted as an infant under murky circumstances; and a blissful relationship with editor Nick Ashcroft, scion of an uber-rich family (whose sister earlier played a decisive role in Maddy’s young life). Then it all unravels. Maddy loses her footing in a late-90’s marketplace skewed toward youth and pop culture. Her daughter announces she’s leaving college to work in Guatemala, hinting darkly at mysterious trouble. And Maddy discovers that Nick has betrayed her in a way she could never have imagined. Her tough resilience, ability to love and sacrifice while making moral choices informs the emotional center of this novel. The intimate drama of a family shadowed by the past, Conscience Point captures the struggles of accomplished baby boomers (and NY social circle insiders) and scrambling to re-invent themselves and stay afloat in the post-literate age (says Maddy, “I won’t move over till I fall over”); offers smart, enlightening observations, information and descriptions of the world of music; lampoons the elitist NY artsy community; satisfies our prurient hunger to eavesdrop on and judge the almost too decadent, consequence-free lives of the mega-rich. Set in part at Conscience Point, Nick’s crumbling family estate, this genre-bending novel also draws on gothic conventions as it uncovers dark secrets while at the same time it plumbs a touchingly human nostalgia for the sort of youthful passion that is seldom equaled in later life. I suppose it was the accident that wild, wet night on Wildmoor that got me writing this story. This . . . call it Gothic modern tale, complete with family curses, unquiet spirits, forbidden love—a bizarre crime, even; seasoned, of course, with ’90s grabbiness and irony. A story rather in keeping with the fantastical contours of Conscience Point. Like some back-lot castle for Ivanhoe, Violet used to joke. Held together with plaster ’n’ spit. I wrote because the accident felt . . . fated; like a crack on the head from the past, capstone to a course set in motion decades back. A course that began one glorious May afternoon when I breached the garden wall to an enchanted country. I needed to understand: How could people so blessed by fortune so bungle it, and end in a pileup of buckled metal? Even allowing for the contrarian imp that rides us all? And my own blindness: How did I not see what was there to see all along? Deep into my draft, though, new revelations surfaced, shoving a counterversion in my face—and forcing me to scramble for a foothold as old certainties crumbled like shale. And then, an odd thing: I discovered I was writing a letter of sorts, across continents and years, to a child in whom all the players in this tale are mingled. If my letter should ever reach him, he’ll learn how we’re all bound up together—he and I, Laila, Violet, Nick. More entwined than through the usual ties of blood. And though we’ve all spun apart now, he’ll sense, my reader, how those ties persist, like phosphorescence lighting the night sea. And he’ll know, too—in the end, real estate rules—that Conscience Point is his to claim any time he chooses. How strangely mixed up together we all are. Isn’t that what Nick said in the library that stormy night? But wait, I’m getting ahead of myself; better not hop all over the lot. After all, I’m writing, too—such is human vanity—to put the world on notice that our little caravan passed this way. The trick is to put a bit of starch in the narrative. The trick is to lay it out the way it happened. Before I start missing them all too much . . .
ERICA ABEEL is the author of four previous books, including the novel Women Like Us, which was a Book-of-the-Month Club selection, and I’ll Call You Tomorrow and Other Lies between Men and Women, collected journalism, including columns written for the “Hers” column in the New York Times. A former dancer, Abeel was, until recently, Professor of French literature at City University of New York. As a journalist, she has published articles in several major journals, including multiple sections of The New York Times. She’s currently working on a new novel and covering film for Filmmaker Magazine and indieWIRE.com. Abeel, a mother, lives and works in Manhattan.